Counter balancing the wilderness is this restful, air conditioned, en-suite game lodge in Botswana. Throughout graceful high arches, quarry tiled floors and barrel vaulted ceilings creating an atmosphere of cool tranquility. A quintessential African flavour of this game lodge in Botswana, overlooks timeless vistas of Africa, the superb international cuisine is served on the terrace. Words cannot capture these colours, the smell of Elephants in thick Acacia, the sound of concentrated buffalo herds on open green plains, the atmosphere of golden red sunsets accompanied by the cry of the Chobe Game Lodge Fish Eagle, nor the excitement of a close encounter with a Lion pride. Chobe Game Lodge game drives are conducted in open sided 4X4 vehicles ensuring maximum visibility, while game viewing on the Chobe River is conducted by small, shallow draft and highly maneuverable boats piloted by expert boatmen. Your resident professional guides offer slide shows, star gazing presentations, garden and river walks as well as walking safaris in the nearby Kasane forests. 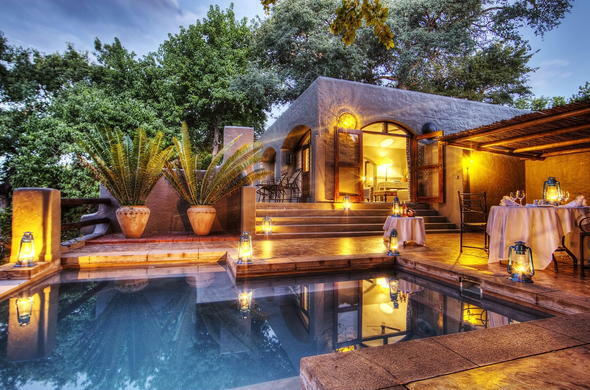 Other facilities at this game lodge in Botswana include: a large swimming pool with terrace, a riverside boma (outdoor enclosure) area where traditional dancers perform, a fully equipped conference room, a business centre for those guests needing to keep in touch, a stylish bar with an outside terrace overlooking the Chobe River and a cigar bar with a full sized billiard table. Meals are catered for at this game lodge in Botswana at the terrace restaurant overlooking the Chobe River. The Chobe Game Lodge's wildlife roams in profusion and diversity. The Elephant population, estimated to 30,000 is the largest single concentration in Africa, survives within the confines of a proclaimed Chobe National Park. During the harsh season the herds migrate south to north and congregate along the fertile flood plains of perennial Chobe River. Other major species such as Lion, White Rhino, Wild Dog, Sable and Roan Antelope are encountered in many areas of the reserve. Being the only permanent lodge in Chobe National Park, Chobe Game Lodge offers unsurpassed game viewing opportunities. Our resident professional guides will introduce you to Chobe either in open 4x4 vehicles or by boat. The Chobe is proud of and very famous for its abundance of Elephants - the highest concentration of Elephants to be found anywhere in Africa! Combined with unforgettable sunsets, this sight will make your safari an unforgettable experience.